Suggested donation of £5+ at the entrance is welcome. Booking essential: 02075639835 or press@helleniccentre.org. Staged as a one-act, 50-minute long drama, ODYSSEUS. Red Rhapsody X revolves around one actor playing a range of roles – Homer the narrator, Odysseus, his son Telemachus, Athena the goddess dressed as Mentor and several suitors. 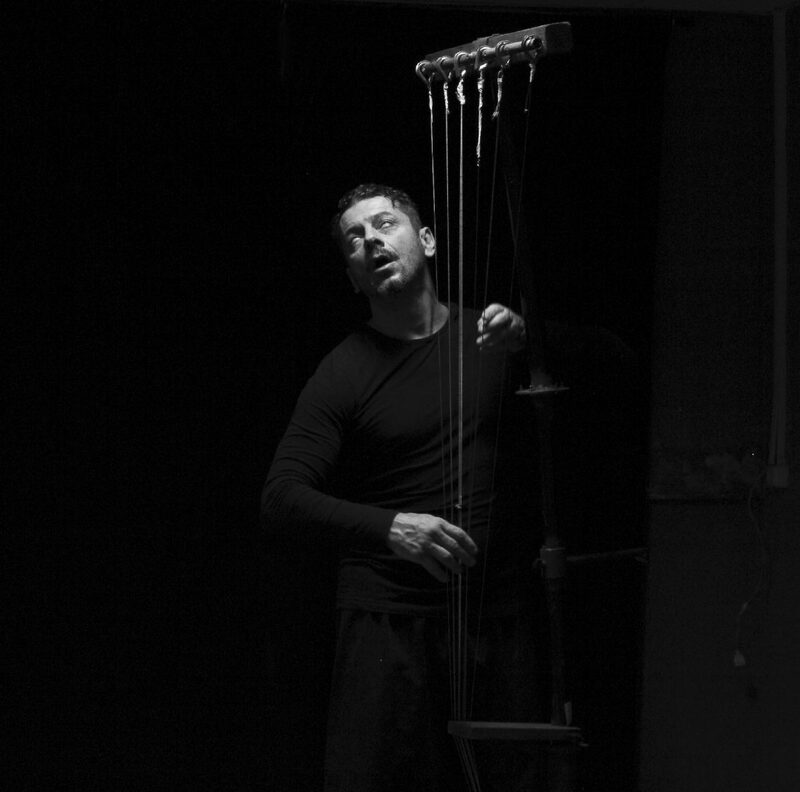 The actor accompanies the spoken language by an improvised phorminx – a string instrument made of wire strings attached with magnets. The result is a primitive acoustic experience. Like in ancient drama, there are no octaves, only tetrads. ODYSSEUS. Red Rhapsody X uses contemporary theatrical and technical means – industrial sounds and percussion, inspired movements and a rain-machine – to stage the end of the saga for modern audiences. Homer’s poetry is performed in its original rhythmic form while overtitled in English allows spectators to follow what’s literally said. However, the aim of the show is to confront viewers with a highly physical performance and breathe life into an otherwise dead language. Surviving a ten years’ war and an adventurous journey at sea, Odysseus comes home a stranger in rags and finds his palace taken over by strangers. Over a hundred suitors have occupied the grounds and surrounded his wife, while plotting to steal his throne and kill his only son. The hero devises a plan to take back what’s rightfully his, and that’s where ODYSSEUS. Red Rhapsody X begins. The Slaughter of the Suitors also known as Rhapsody 22 has been described as one of the most brutal, yet most gripping and richly symbolic pieces of world literature. ODYSSEUS. Red Rhapsody X aims to take modern audiences on an experimental journey, part time-travel, part discovery, possibly unlike anything they’ve heard before. Meth’odo’s work is unique and rare as it performs Ancient Greek Drama in the original language based on the metric laws of Poesies. Complex and musical in its tone, the original dramatic language melts sound and meaning in a way that urges audiences to feel rather than think. The acoustic result could be close to how drama was experienced in ancient times, an issue that is still researched by dramatologists and linguists today. Meth’odo’s approach is experimental. As such it does not aim at accurately reconstructing ancient drama. The group stages ancient dramatic texts as a visual-acoustic and kinesthetic experience for modern 21st century audiences. The theatrical and musical means used draw from percussion, improvised instruments, masks, contemporary and traditional body movement venues. Actor, director Yiorgos Panteleakis studied Performing Arts at Essex College Balto,USA, at the Akis Davis Drama Lab in Athens, Greece and Physics at UMass Lowell, USA. Born in Athens Greece, left the country for the United States of America where he resided for eleven years. Founder of the theatrical Research group “Meth’odos” and “Independent Greek Cinema”. He has been researching ancient Greek drama for the last 15 years and his experimental approach is unique in Greece. With Meth’odos he has produced and acted in three theater productions to date, including Ajax (2004) and Eumenides (2009) and ODYSSEUS. Red Rhapsody X. In 2013 he founded Independent Greek Cinema. digital film production company, along with Contemporary Performances. It focuses in Art Films and Cinematic Documentaries on contemporary themes. Its aim is to redefine the compass of Independent filmmaking and audiovisual experience in an attempt to allow spectacle and spectators merge in a new level of awareness. It strives to involve itself in projects with a new approach of integration and fusion of the human experience. In 2012 he won the BEST ACTOR AWARD with the film “Serenity” at the Black Box Film Festival in Florida, USA.He won BEST DIRECTOR and BEST SCREENPLAY at the Greek Film Academy Awards in Chalkida (Greece) for his 2013 documentary “Boxer”. With the documentary “155 Sold” he participated in various film festivals in Greece, as well Festival de Popoli in Florence and Jihlava Doc Film Festival(Czech Republic). His short 2008 fiction film Zoe won 1st MALE ROLE, 2nd FEMALE ROLE, and MAKE-UP awards, his 2006 short film “About the Weapons” won 1st AWARD BEST SCRIPT at the 12th International Fantastic Film Festival, Athens, Greece. Panteleakis is a full member off Greek Director’s Guild, European Federation International Federation M.E.I.F.E.R.A., Equity UK and Greek Actors’ Union. Theater Review on “Eumenides” in “What’s on” by George Sarigiannis, Postman Magazine June 3rd /2005. «Meth΄odos» group interprets through the laws of Metric the vibration-resonance of the ancient text and its translation in Prosody, creating vocal and orchistric schemes. The aim is not the reenactment of Archaic poetry, but its contemporary expression in Vision and Sound. The actor and the interpretation made are an animated ideogram in which “Poetry” remains a living electrosized organism whole and sufficient. The work conducted is rear and authentic as there are few that involve themselves in a similar manner.